1. How to cancel your Kanbanize account? Only users with "Account Owners" or "Make Payments" privileges can cancel their Kanbanize subscription. 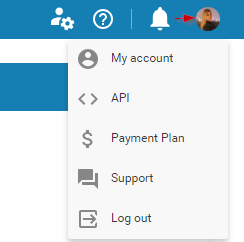 To cancel your subscription -> please, access your account and click on your avatar at the top right side of your board interface -> select Payment Plan from the menu. TIP: if you want to export your account data before the account cancellation, please use the Advanced search tool in Kanbanize and export the data in Excel spreadsheets. To proceed further, click on the red button -> Cancel Account in the Subscription Plan Panel. We will appreciate if you tell us: "What made you cancel?" and give us your feedback about the software -> Click on Cancel Account button to confirm your cancelation. Annual subscriptions are prepaid for a year ahead and they are not automatically renewed. In case that you cancel your subscription 4 months before the due date, your account will be still active and users will be able to use it fully-functional until the expiration date. The monthly recurring subscription is automatically renewed on the account due date. If you cancel your subscription 10 days before the due date, your account will be still active and the users will be able to access it until the end of the prepaid month. If you have committed to this plan and you decide to cancel your subscription before the due date, your account will remain active and the users will be able to use it fully functional until the expiration date. Note: there is a penalty for the cancelation of the monthly annual commitment subscription. Its value varies depending on the remaining period: it is equal to 50% of remaining committed subscription amount. In case that you want to immediately close your account (irrespective of the subscription plan) and purge your data right away, please contact our support team at support@kanbanize.com. If you keep to the standard procedure, please note that 3 months after the expiration date, your account will be locked. Users will still have access to the Advanced search tool that allows them to export account data in Excel spreadsheets, but they will not be able to use the system. During that period, the Account Owners can re-activate their accounts and renew the subscription. All they need to do is access their account and use the Payment panel. The account setup will be preserved as it was prior to the cancelation. When the 3 months period expires, your account will be permanently removed from all data centers and back up systems. At that point in time, the account cannot be recovered anymore.